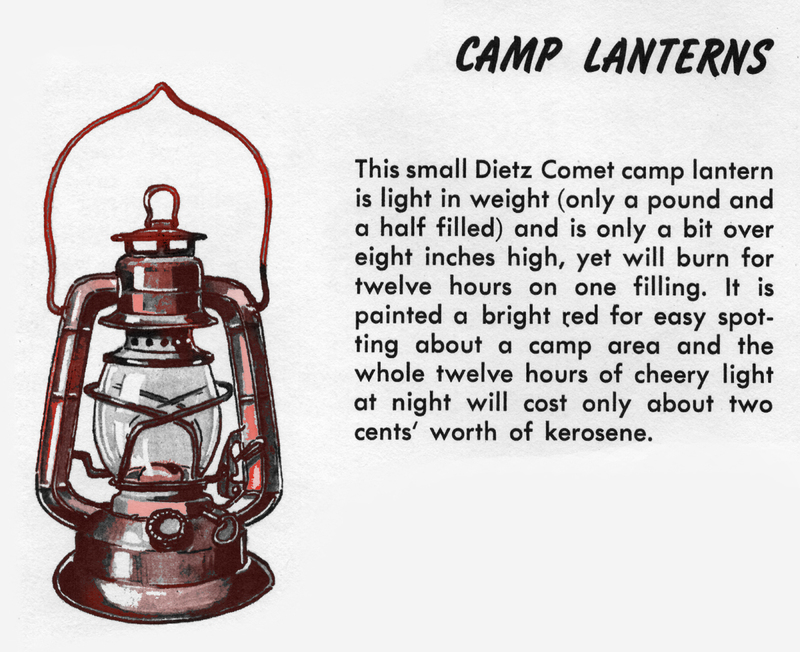 Now let’s consider another of my favorite traditional camping lights – the tubular kerosene lantern, often seen in many old photographs of early camps. Though they weren’t used much (if at all) on hikes, they were popular with outdoorsmen traveling on horseback and canoe and were used in all fixed camps. 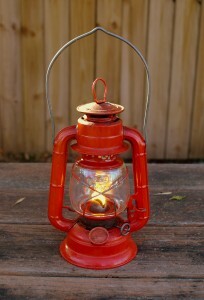 Everyone knows what these kinds of lanterns look like but most today have never actually used one. 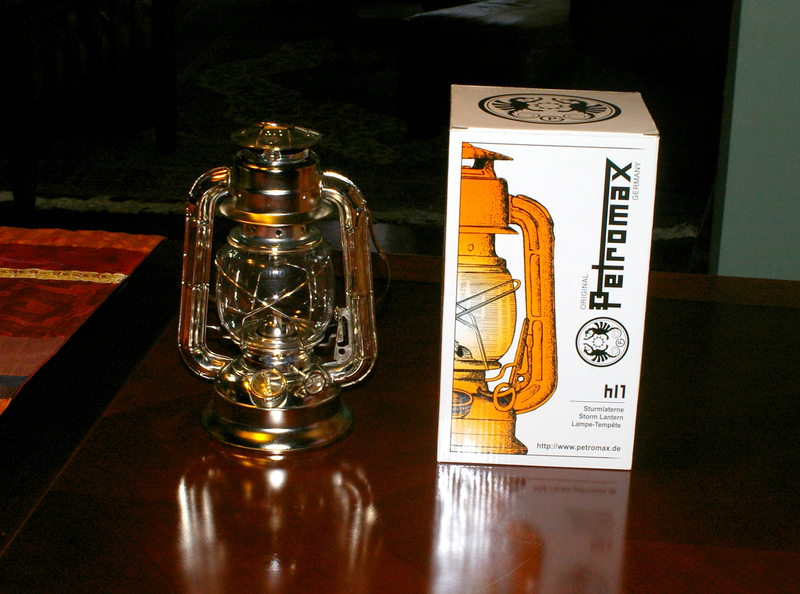 The introduction of the kerosene lamp in the 1850’s was a remarkable achievement. Before that, illumination was provided by candles or “wick” lamps fueled by vegetable oil, lard, whale oil, or “camphene”, a mixture of alcohol, turpentine and camphor. However, all were imperfect, being either too thick to wick easily, too expensive (Whale oil cost the equivalent of $200.00 a gallon in today’s money), too dangerous (camphene’s inflammability led to many deadly fires), too dim and/or produced disagreeable fumes and soot. By comparison, kerosene was revolutionary. It burned brighter than any fuel but whale oil, was not easily ignited and proved very safe to use. It didn’t smoke unless the lamp was improperly used or not maintained, and was less inexpensive than even vegetable oil. However, in single wick lamp form it produced a flame just slightly brighter than a single candle (due to the larger flat wick). Invented by John H. Irwin (1839-1890) in the late 1860’s, and popularized by lamp merchant and manufacturer Robert Edwin Dietz (1818-1897), the tubular kerosene lantern revolutionized illumination technology through the principles of injecting either recirculated, heated air (hot-blast lantern) or fresh, cool air (cold-blast lantern), to a burner to improve brightness (both principles are based on carburetion). This boosted brightness from 4 to 14 candle power, depending on the height of the lantern chimney and width of the wick – a significant improvement over the “dead flame” lanterns of the period (the Stonebridge lantern is one example of a dead flame lantern). Dead flame lanterns provide air circulation to the flame through the use of low and high vents but do not burn much brighter than a single candle flame as they do not employ carburetion. Of the two types of kerosene lanterns, the hot blast models are the most fuel efficient and provide for more complete combustion of the vapor, making them distinctly better for use in enclosed areas. However, cold blast lanterns quickly dominated the market because they produce a white flame that’s twice as bright as hot blast models. Tubular lanterns are remarkably safe (if tipped over, they self extinguish in a few seconds) and if fueled correctly, provide dependable light that will burn all night long, even in very windy conditions. The advent of rural electrical service after WWII spelled the end (mostly) for the kerosene lantern in the U.S. and other developed nations but much of the third world continues to be illuminated by them. 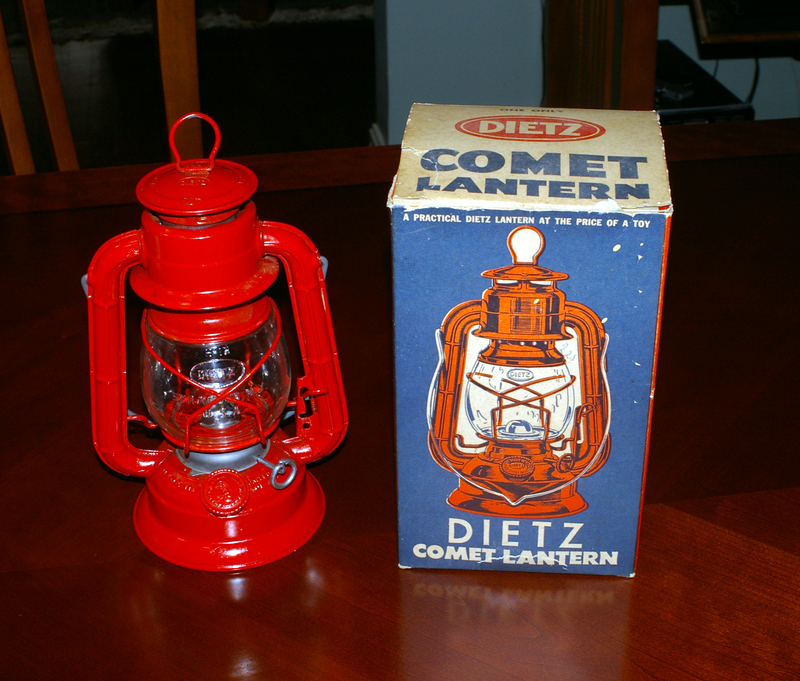 In the 1950’s, as lantern sales began to decline in the U.S., the Dietz company founded a branch in Hong Kong to establish a presence in Asia. 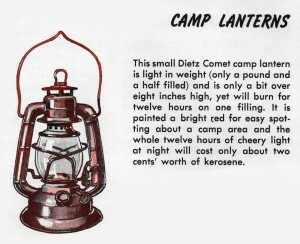 Even after Dietz finally ended domestic production (1971), the R. E. Dietz Co., LTD of Hong Kong (factory in Guangzhou, China) carried on to become the largest maker of kerosene lanterns in the world. 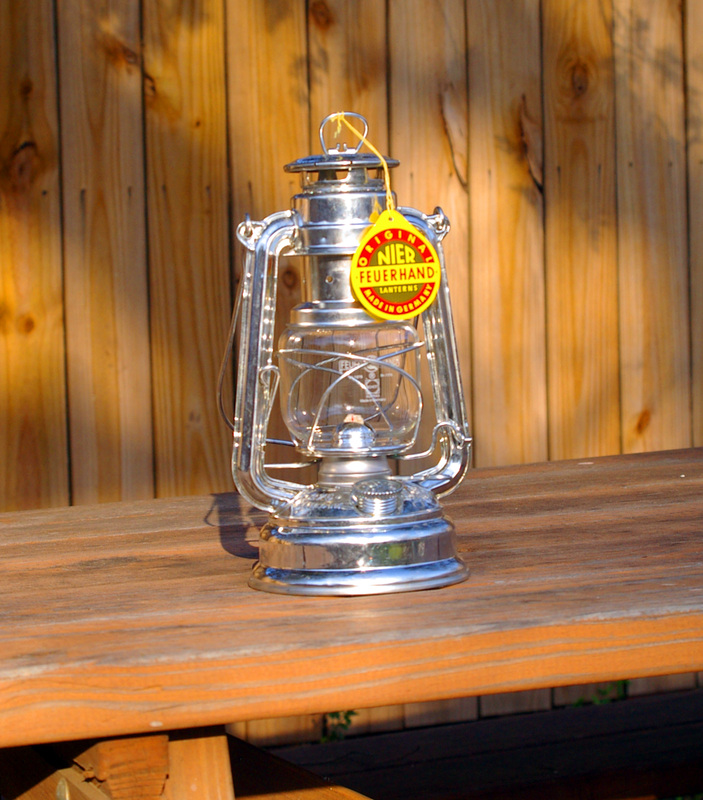 Luckily, you can still purchase new Dietz lantern models that are unchanged from those made 100 years ago (their hot blast “Monarch” has been in continuous production since 1900). 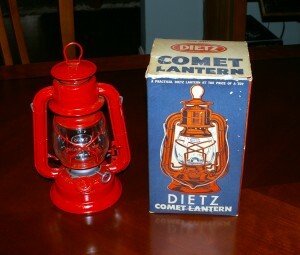 My favorite Dietz dealer is W. T. “Woody” Kirkman, the acknowledged lantern guru of America. Kirkman stocks the entire line of Dietz lanterns in every color and finish and offers them at very reasonable prices. 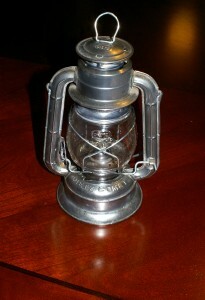 In addition to selling Dietz products, Kirkman also markets his own line of premium lanterns (made by Dietz). These are an improvement over the standard Dietz models as they feature old-style “wing-lock” burners that offer superior wind resistance, bodies are galvanized for superior rust resistance (some are offered with paint over the galvanized finish) and globes are made from thick, heavy, weight-pressed glass just as lantern globes used to be made. Kirkman has produced three models thus far, all historic types that come the closest to lanterns that date from the turn of the century. Kirkman also produces an American-made 1870–1890 style “square tube” hot blast lantern in brass, the only one of this type produced in the world. Kirkman’s also distributes the German-made Feuerhand, brand lantern, the last remaining tubular lantern manufactured in the western world. Sadly, though the company made many different models in the past, they now market only the model 276 “Baby Special” lantern (as far as I can tell). These lanterns come with a leak-proof-tank guarantee and are fitted with German-made Schott brand Suprax (same as Pyrex) glass globes. Offered in painted and tin plated versions, the tin plated version looks nearly identical to the 276 first produced in 1934. Another U.S. distributor of the Feuerhand lanterns is Garrett Wade. Although the company does not indicate that these are Feuerhand lanterns on their website, I have confirmed that they are indeed Model 276’s. The Garrett Wade price of $32.95 seems a bit high (they cost about $19.00 in Europe) but they are German made. 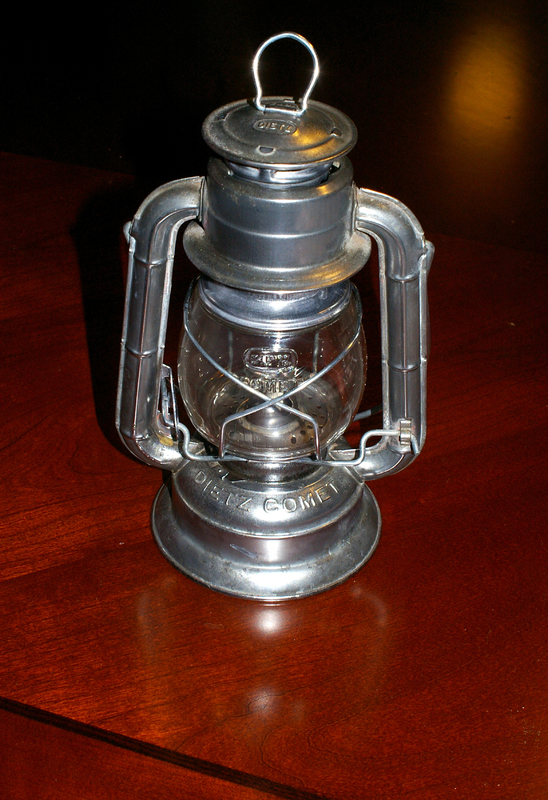 Another good lantern is the Dietz made, German distributed Petromax hl 1 Storm lantern (NOTE: Now appears to be discontinued. More about this model in my next post). 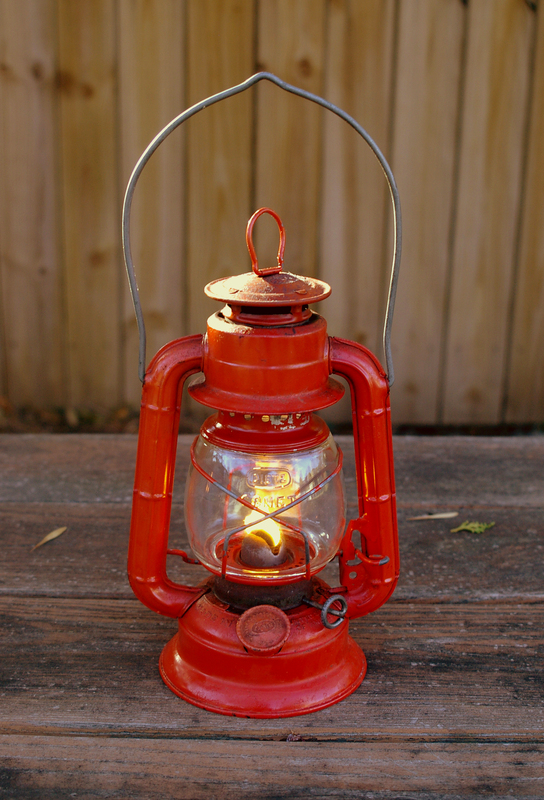 For much more information on kerosene lantern history, use and maintenance, please see Kirkman’s FAQ page here. 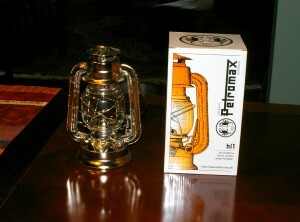 In my next post I’ll highlight the tubular kerosene lantern models I consider most appropriate for traditional camping. Camp lights are useful for doing chores after dark, reading in the evening, traveling at night and providing enough low light to get settled for bed. Camp lights can be divided into three types – flashlights, headlamps and lanterns. Flashlights and headlamps provide (mostly) concentrated light while lanterns produce ambient light, the kind best for lighting the inside of a tent. 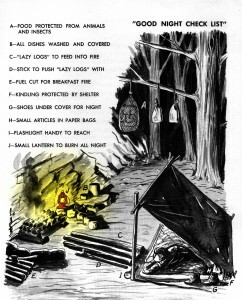 So most campers now carry either a flashlight or headlamp and a lantern. Headlamps are now more popular than flashlights because they allow you to work with your hands free. Modern headlamps have become very compact as the advent of energy efficient LED lighting makes it possible for the light to operate on batteries mounted within the lamp housing instead of the old types that required an external belt mounted battery pack. There have been advances in flashlights as well, with high performance ultrabright LED and incandescent models now dominating the market. Some of these cost nearly $150.00 with the average being around eighty bucks. Examples of these are the Petzl Tikka XP headlamp (120 lumens max, 120 lumens, 2 hrs/low light/100 hrs) and the Surefire G2X Pro Dual-Output LED flashlight (320 lumens, 2.75 hrs/15 lumens, 145 hrs). It’s a fact that Americans like superlatives. We want the lightest, strongest, smallest, largest, newest of whatever is made. With camp lighting it’s no different. Most folks want the smallest, brightest camp light possible. In the quest for extreme brightness we’ve created lights that use significant resources in the form of batteries (according to David Wescott in the book Camping in the Old Style, a battery requires fifty times more energy to produce than it will return to the user). Once they’ve been used, batteries go to the landfill where they leach toxic chemicals into the environment and then the process starts over, requiring us to extract even more resources to produce their replacement. That may be an acceptable tradeoff for rescue lighting but do most campers need such extreme candlepower? I doubt it. Backpackers got by for years with the small Mallory plastic flashlight and a candle lantern. I doubt anything more is required. The Woodcrafters also valued dependable camp light. 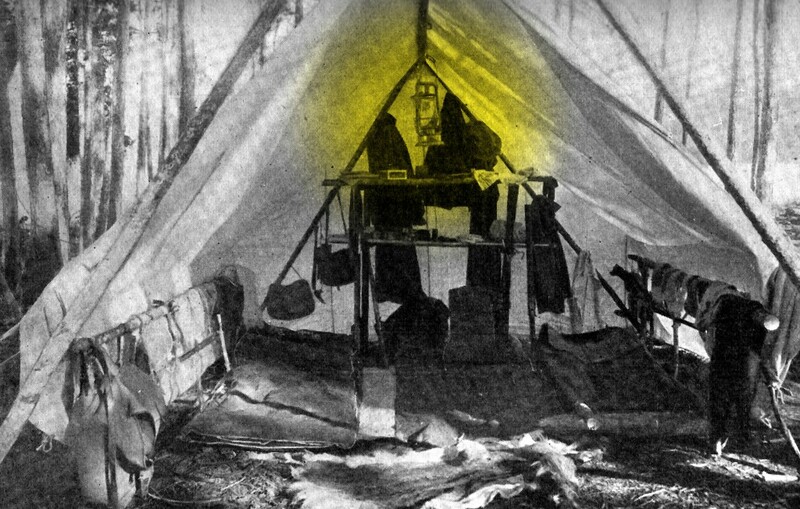 Of course light output was limited by the technology of the day but they were content to light the camp with a glow not a glare. In my next post I’ll cover the first of two classic traditional camping lights – the Stonebridge Automatic Folding Candle Lantern.